Keep your floors seed-free with the Sheer Guard Bird Cage Skirt. This innovative accessory is made with a beautiful sheer material that allows for total visibility so your flying friend can enjoy the daylight. 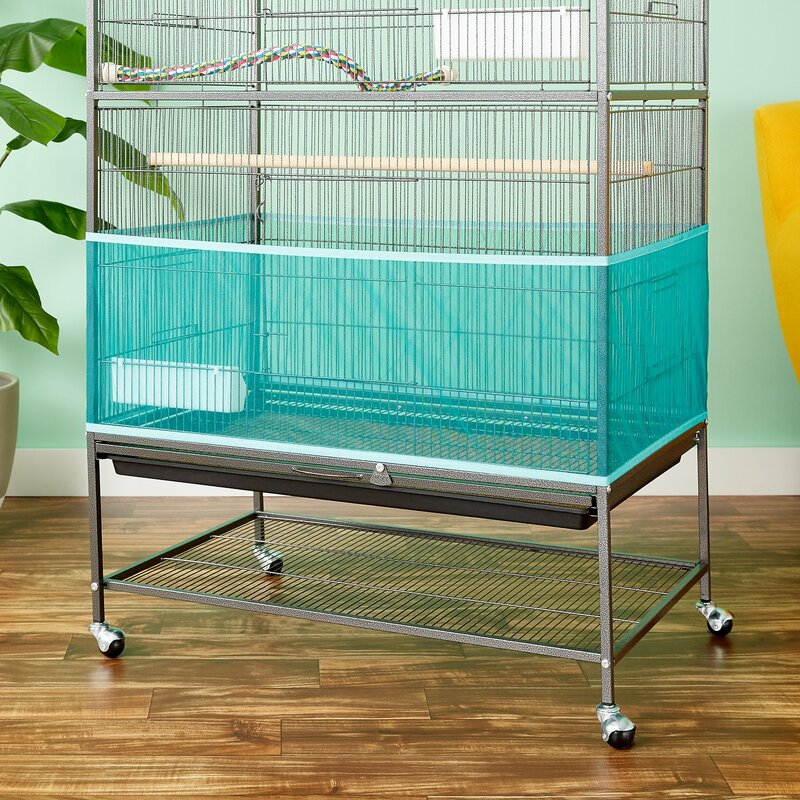 Designed to keep bird seed and mess inside of the cage and not under your feet, this sturdy fabric is easily washed when dirty to keep your bird’s home fresh and clean at all times. Plus, the sheer design allows air to flow in and out of the cage, keeping your feathered roommate at just the right temperature. With multiple sizes and colors to choose from, it’s easy to pick the skirt that best suits you and your companion. Innovative bird cage skirt helps keep the mess inside of the cage and off of your floor. Elastic at the top and bottom allow for a perfect and tight fit around any sized cage. Sheer material lets your bird to see through the skirt and allows air to flow freely. Easily washable to keep your cage clean and pleasant for your feathered buddy. Proudly made in the USA for a durable and original accessory—perfect for any bird-lovers home. It only controls it a little. We have two parakeets and two finches, in two flight cages, one stacked atop the other (otherwise the parakeets bully the smaller finches). These guards do keep them from sending the seed hulls clear across the room, but the amount accumulated directly around the cage itself is the same after two days that it used to be in one day. So I still must slave for the privilege of having birds. I don't know who listed the size dimensions for these guards, but they are way off. I have a 17"W 13"D cage and the small will not go on. I would rip it trying to force it to stretch that much. Luckily I called Chewy.com and the lady who helped me was so awesome, she waived the shipping fee for the replacement ones in a size medium. So their sizing on the package is so misleading and the company that makes them needs to change it. If your cage is my size order a medium! I bought a set of these in size large and they fit my African Grey's cage but they do not fit my McCaw's Cage. Works great for keeping seeds inside the cage. Also prevents my dog from trying to pull the bottom tray out to munch on the scraps the bird throws to the bottom. This doesn't catch everything, but I didn't expect this method to get 100%. It fit perfectly on my cage and looks really nice. Great price, too. The size is the perimeter in inches of a square or rectangle shaped cage (same as circumference for a circle); 2X length + 2X Depth. These fit as stated, look good, animals can still see their people, move out of the way easily for door opening, and -most of all-contain the mess. I put them (2) on a ferret cage that we house guinea pigs in. They are easily inverted at the bottom to empty accumulated contents. And they arrived at my door before most places even SHIP! Thanks, Chewy! I got these for two reasons. One is to keep the seed in the cage and not on the floor, and the other is keep the dogs out of the tray below that catches all the seed. I got the clear ones and they work great. The birds don’t seem to be bothered by them and it definitely keeps the dogs from eating the droppings and seeds out of the tray below. Wish I would’ve find these along time ago. 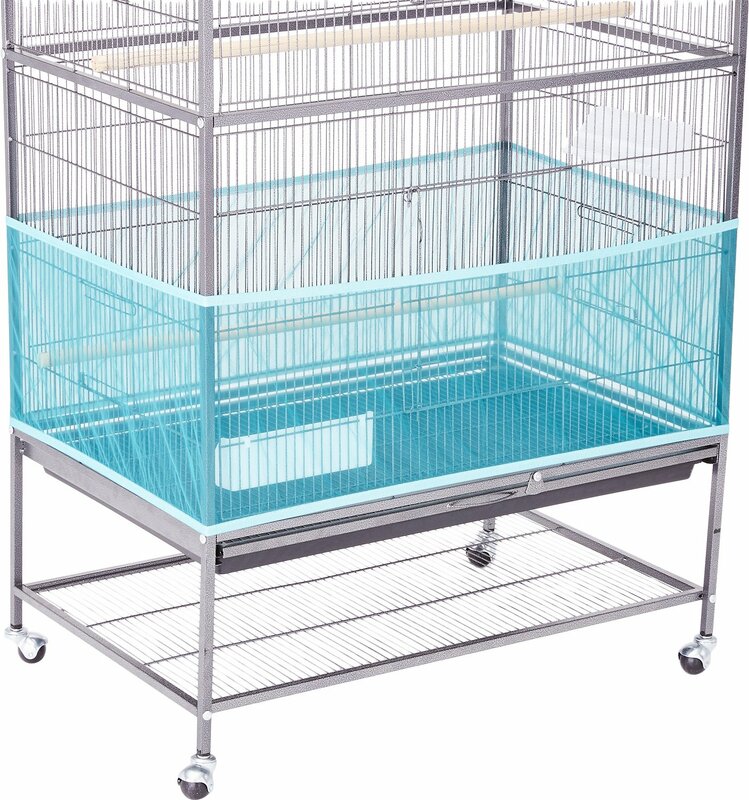 I purchased the small for my cage (lools almost identical to the one in the photo) but it is so small. I'll be buying a large to ensure I get it right this time. No big deal but I do recommend order the size above what you think, and dont go by the photo. 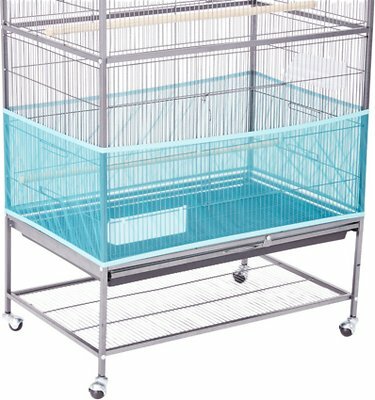 I bought this to put around the cage of my degu's, because they keep pushing and throwing their bedding, food, and #2's out the sides and onto the floor. This keeps it all in, however they are still smart & curious, and have found a way to chew it up a bit, but it's still holding it's purpose! I bought this for my daughter’s birds. I haven’t seen it in action, but she is very pleased with it. She loves the little critters, but hates the mess they make, and so far this bird cage skirt has really helped. The seed catcher runs smaller than it should. There is no room to stretch the elastic hem around the cage. It was a struggle. If i want to remove it to wash it, I'll have to cut it off.